Weather predicted for tomorrow’s launch of Flying Squirrel #2 continues to look very good. Winds will be light, and temperatures are in the upper 80s and low 90s which is mild for the desert this time of year. All is looking good! The predicted landing location has moved a bit north into the Mojave National Preserve. 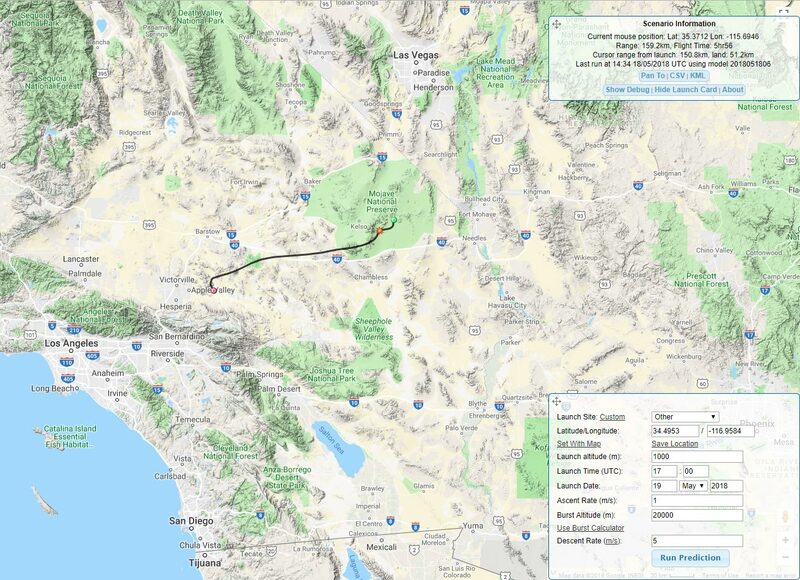 This would be an excellent location for recovery as most of the area near the predicted landing zone is a wide valley with few mountain peaks and has roads. This prediction however is still a guess because the bursting altitude of the balloon is not known. The burst altitude will affect how long the balloon is in the air and thus how far it travels.